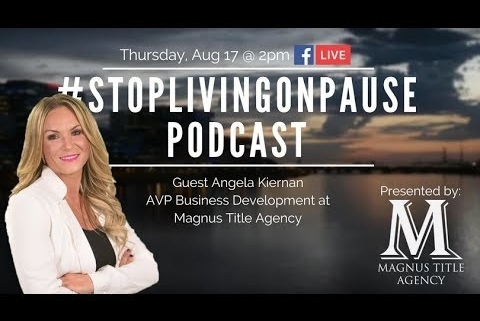 SPONSORED BY Magnus Title Agency who is the state’s largest privately held title agency. This is important because decisions on each transaction you get the immediate attention of the executive management and staff who have the authority to make the sometimes tough decision to get your transaction completed. Magnus Title is valley wide. — THE dominant force in Power Ranch and who in just 3 yrs has gone from a rookie real estate agent joining forces with her father and has turned The Home Selling Team of Randy and Janine into a top producing real estate team ranking in the top 1% of the Phoenix MLS. What are the holes and/or trouble spots in your business? What is the tool, system or vendor you could not do without? What is the biggest difficulty or challenge in your business right now? Advice for new agents getting started with farming? Remember, all #StopLivingOnPause PODCASTS are simulcast on YouTube LIVE and Facebook LIVE at the time of our recording. So, don’t forget to subscribe on YouTube or Like our Page to be notified when we go LIVE and to join the conversation. SPONSORED BY Magnus Title Agency who is the state’s largest privately held title agency. This is important because decisions on each transaction you have get an immediate attention of the executive management and staff who have the authority to make the sometimes tough decision to get your transaction completed. Magnus Title is valley wide. The PressPlay Realty Network whose agents rank in the Top 1% of teams nationally and is only the 12th team in the country to have 5 or more locations, all of which are in the Western United States. In 2014, Bullington made the move to the Phoenix real estate market to open the 2nd location of her Bullington Home Team. With the main operations for the business still located in Tucson, Bullington began making a name for herself in the Phoenix Metro Market. Today, Bullington, now joined by her husband and business partner Rory Bullington, operates a team of 7 agents covering the Greater Phoenix and Tucson markets. In addition, the power couple have lately been making a new name for themselves in the renovation market. Fix and flips have always been a passion for Bullington whose latest project is a beautiful Ranch style home in Scottsdale. Completely renovated inside and out, this home is a true show stopper and is what the Bullington and her Bullington Home Team is all about. To learn more about Stephany, her husband Rory and the rest of the Bullington Home Team at Revelation Realty, check them out at http://realtyprosaz.com. July 11, 2017 /0 Comments/in Podcast /by Jason Wells, Esq. This is the final of our 4 part series on Referral Relationships and today we are talking business to business networking and marketing and how it is you strategically find the best businesses to partner with and not just market to so you receive their pipeline of referrals. SPONSORED BY the PressPlay Realty Network whose agents rank in the Top 1% of teams nationally and is only the 12th team in the country to have 5 or more locations, all of which are in the Western United States. – The California Bureau of Real Estate is going after agents they believe are “pretending to be brokers.” The CalBRE issued a warning to all licensees that they would be handing out significant fines, revoking licenses and even seeking criminal prosecution against those agents they find are in violation of the rules. – The CalBRE is concerned that consumers are being misled by agents using “real estate” in their team names or stating that they are “independent” professionals. – Other states to take similar steps include South Carolina who banned “real estate” and “realty” and Michigan that now requires the brokerage to 100% the size of the agent or team’s name on signs. – What a series this has been? We have covered what it takes to build and capitalize off of referral relationships starting with how to mine Facebook Gold in Ep 12, making over $100,000 from just your database in Ep 13, how incredibly powerful client events can be with our guest Angie Patten in Ep 14 and now we’ll finish off our Referral Relationship series discussing B2B partnerships. – What is the difference between a B2B and a B2C relationship in real estate? – B2C is what the typical agent looks to build. It is one-on-one and one-by-one relationships. – B2B networking with and then partnering with a strategic business that can provide a direct benefit to each business. – Why do agents struggle so much with B2B? – What benefits have we seen from B2B relationships? – Value is adding to their business, solving their problems, supporting their specials or events. It is being a partner. – Follow-up is essential. Don’t be a one and done agent then wait for something to fall from the tree. Think of people that contact you for referrals. 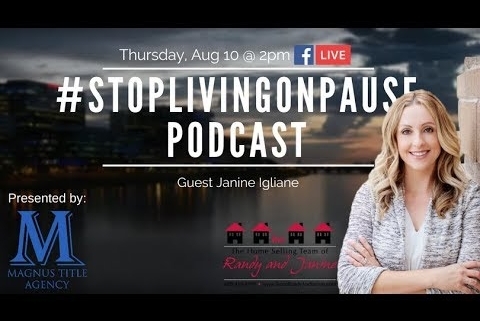 – Remember, all #StopLivingOnPause PODCASTS are simulcast on YouTube LIVE and Facebook LIVE at the time of our recording. So, don’t forget to subscribe on YouTube or Like our Page to be notified when we go LIVE and to join the conversation. March 16, 2017 /0 Comments/in Podcast /by Jason Wells, Esq. Client events are an increasingly popular way to stay in contact with clients for agents to use in building their business. After all, who doesn’t like to be invited to a movie premier, sporting event, picnic, BBQ, bowling or something like that? Agents who incorporate these sorts of client events or client appreciation events into their business strategy are seeing massive success as they are really getting what it means to build Referral Relationships. This is the 3rd in our 4 part series on Referral Relationships and today we have a special guest who has mastered the client event, Ms. Angie Patten of the Chris and Angie Patten Team at Keller Williams East Valley. Let me ask you something: How different would your life be if you were bringing in $100,000 a year or enough that you didn’t have to worry about bills? Small business owners such as real estate agents have the ability to do exactly that if they only knew how they should be working their sphere of influence. — The combined value of every home in the United States is expected to climb to a record high of more than $29.6 trillion, up 5.7 percent from just one year ago. If this seems like an unfathomable number, that’s because it is. Let me try to put it in perspective for you. — In fact, it would take 339 people with the net worth of Bill Gates ($84 billion) to purchase every home in the United States! What an opportunity with 42% of buyers and 64% of sellers coming from referral business. — What does it take to get a referral? Value Touches increase connectivity, increase interaction, increase mindshare and make relationships stronger. 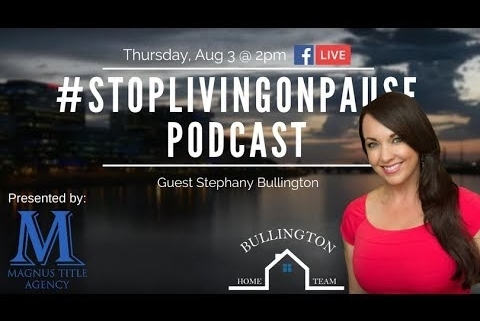 — Remember, all #StopLivingOnPause PODCASTS are simulcast on YouTube LIVE and Facebook LIVE at the time of our recording. So, don’t forget to subscribe on YouTube or Like our Page to be notified when we go LIVE and to join the conversation. At Inman Connect New York this week, VP Ryan Johnson made an appearance on stage and talked about Opendoor but also seemingly was working the PR angle to calm the concerns of agents. Stated they are looking to partner with agents and brokerages in the 3 cities they are in (Phoenix, Dallas and Las Vegas) as well as the 10 new states they are expanding into this year. Goal setting is nothing new and perhaps one of the oldest tips for success in business and life. However, just setting the goal doesn’t get it done. Execution on the goal is the determining factor of going from a goal setter to a consistent goal achiever, and time blocking is the discipline to get you there. Leads the expansion and recruiting efforts for the network and oversaw a 150% increase in agent count during 2016 and an increase in closed volume from $30M in 2015 to $45M in 2016. She will also be leading our all new PressPlay Sales Training Academy. Do you time block every little thing, categories, what? How often should you time block? Weekly, daily? Yearly? What happens to a person’s business when they fail to time block? Innovation and disruption are occuring at an incredible rate through real estate. Agent and brokers need to either figure out how to create or embrace those disruptions or else they will be looking up as the world moves on without them. Smartphone traffic will exceed PC traffic by 2020. In 2015 PC traffic was 53% but by 2020 it will by around 29%. What is value? How do you know your value or UVP/USP? Remember, all #StopLivingOnPause PODCASTS are simulcast on YouTube LIVE and Facebook LIVE at the time of our recording. Subscribe on YouTube or Like our Page to be notified when we go LIVE and to join the conversation.